You all know how big WordPress is — 30% of all websites are running WordPress. It’s important for Ecwid to be the best fit for those WordPress users who want to sell on their sites. Our official WordPress e-commerce plugin is what we use to make the Ecwid experience of WordPress sellers especially good. Here, I will list the most noticeable improvements we’ve added to the plugin this year. Gutenberg is getting more and more popular and will soon be the default WordPress page editor. To make sure Ecwid users are ready for that, we added Gutenberg support to our e-commerce plugin for WordPress. Now, if you edit a page in Gutenberg, you can see the new Ecwid block in the editor toolbar: Add Store and Add Product. They can be used to add a product catalog, single product widget, or a Buy Now button to the WordPress pages and posts in a simple, user-friendly interface. Some sellers copy their products to Ecwid from WooCommerce, other shopping carts, or a local database or spreadsheet. We’ve made it easier. 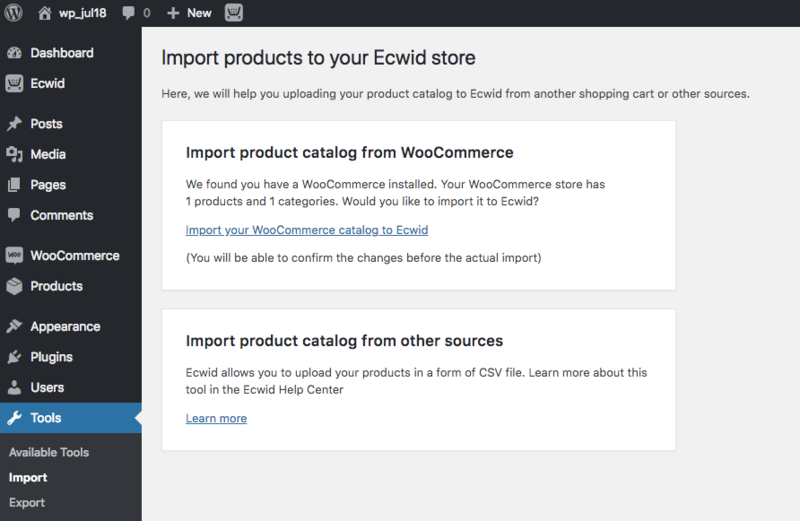 You can now see a separate Ecwid block under Tools → Import in the WordPress admin backend — it allows you to import products and categories to your Ecwid store from WooCommerce or an external CSV file. Dozens of merchants have already used this tool to copy their WooCommerce products to Ecwid, so we continue working on it. We’ve added a new floating shopping bag widget that displays a cart icon along with the number of items and subtotal in the corner of the screen. This way, the shopping bag’s always visible — buyers can click it to check their cart contents and proceed to the checkout. It’s possible to customize its position, layout, and icon to fit your site better. Enable it under the Ecwid section in your WordPress admin backend: Appearance → Customize → Ecwid. Historically, the Ecwid store management dashboard displayed navigation within the central page content when you open it in your WordPress admin backend. So you open the Ecwid menu in your WordPress admin and then navigate through the store admin pages inside that general Ecwid page. We’ve improved this process: now the store admin navigation menu is included in the WordPress admin menu. You can find management, settings, apps, and other sections right in the WordPress left-hand navigation sidebar. This aligns the Ecwid plugin navigation with the general WordPress navigation and provides a more natural way to find the right page of the store dashboard. Also, it frees some space in the page’s central area, which makes it more convenient to manage your store, especially on mobile devices. We’ve added a new Ecwid block to the WordPress admin dashboard — it features helpful e-commerce articles from the Ecwid blog. The block refreshes itself automatically when we publish a new blog post. You can find fresh product updates, tips, and recommendations from the Ecwid team there.